where Q, u, and < are the longitude of the ascending node, the argument of perigee, and the inclination; and x,y, and z are resolved in the coordinate system in which the elements are defined. It is possible to use Eqs. (5-33) and (5-34) to remove the explicit true anomaly dependence in Eqs. (5-36) through (5-38) and thus compute the position directly. The velocity at time t may be found by applying the chain rule to Eqs. (5-36) through (5-38). Thus, for example, dx dx _3r_ 9£ 3x jip_ 3E ,, «q. The above procedure is not coordinate-system-dependent; that is, the position and velocity will be in whatever coordinate system the elements of the orbit are defined. For Earth-orbiting spacecraft, the elements are usually given in geocentric inertia! coordinates, whereas for interplanetary orbits, the elements are usually given in heliocentric coordinates (see Section 2.2). The simple two-body orbit generator described above may be modified to take into account noncentral forces (or forces from a third body). The procedure, which is known as the method of general perturbations (Section 5.5), is to obtain series solutions to the equations of motion in the form of perturbations to the orbit elements. These elements then become functions of time, and the method outlined above for solving Kepler's equation is applied with different elements each time the position is to be calculated. (Some simple results of general perturbations, in showing the effect of the oblateness of the Earth on the orbit of an Earth satellite, are given in Section 3.4, Eqs. (3-37), (3-38), (3-42), and (3-43).) Increasingly accurate descriptions of the actual motion of a spacecraft can be obtained by including an increasing number of perturbation terms (both periodic and secular). 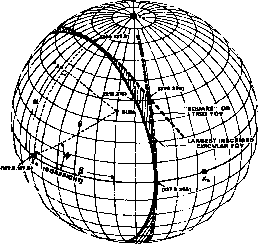 This forms the basis of the Brouwer method, which is a detailed application of the theory of general perturbations to the motion of artificial Earth satellites. A simpler, more direct approach to the detailed calculation of orbits is to integrate the equations of motion directly, given the initial conditions. This is known as the method of special perturbations (Section 5.5). Models of all forces which are expected to be significant are included. Two commonly used integration schemes are those of Cowell (integration in rectangular coordinates) and Encke (calculation of an osculating conic section for which integration gives the differences between the real coordinates and the coordinates given by the conic section). Methods of this type are used in GTDS.